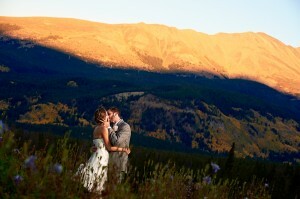 Mountains are naturally romantic, and for some, the reasons might seem obvious, but to help others see the light, I’ve created what I think are the top 10 reasons to have a destination wedding in Breckenridge, Colorado. You can plan your day the way you want it. Want to create a modern lounge atmosphere in a tent? You can do that. Or, how about a 50’s-themed wedding with floral decor that looks like milkshakes and a black-and-white checkered floor? You can do that too. Have fun with it and show off who you are as a couple. Surprisingly, most lodging companies will offer group discounts and incentives for weddings. Choose the Mountain Thunder Lodge for an in-town experience, or choose the ski-in, ski-out luxury of One Ski Hill Place. You will always see the mountains in the background of your wedding photos. When you stare deep into those images, you’ll remember what the air felt like, how fast the day flew by, and most of all, how all of your loved ones were surrounded by the majestic Rocky Mountains. The groom will get more involved with the planning. Mountains offer adventure the guys can get into, so ask him to help plan some of the activities. Choose between scheduling a rafting trip or trying stand up paddling. He can book the mountain bike rentals and study a map before exploring the awesome network of trails that criss-cross the ski area and town. A destination wedding means that a smaller crowd is almost guaranteed. You don’t have to invite everyone. It’s your wedding and it’s perfectly fine to focus on a core group of family and friends. Less drama on neutral territory. Remove the family drama variable when choosing to celebrate. Families will bond as they spend time together out on the trails and in the lodges as the wedding guests stay for a few days, versus a few hours. And if it’s a destination, then no family feels left out of that “home-town” experience. Explore museums and mining sites scattered around Breckenridge that tell the story of the gold rush and the characters that once roamed these parts. The rustic cabins also make for fun photo shoot locations. 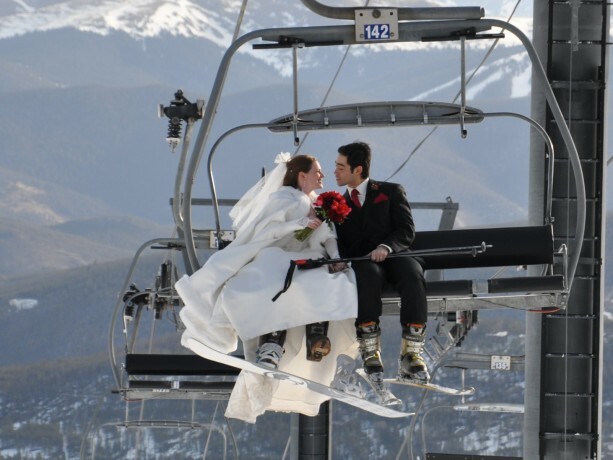 Sport your skiing or snowboarding boots for photos coming down the mountain before getting married, and then switch over to cowboy boots to wear under your wedding dress. They won’t stop talking about the wedding for a long time. The Breckenridge wedding experience includes being transported to the venue via gondola and the bride and groom exchanging vows with a naturally dramatic scene of mountains and streams fed by snowmelt. The Breckenridge Ski Resort is one of the most popular ski resorts in the United States, and for good reason. Breckenridge is easy to get to, and is less than two hours from Denver International Airport (DIA). Learn more about all the wedding venues, prices, and options in Breckenridge at the Breckenridge Weddings page. Check out more photos from a few of our favorite weddings. When are you getting married? Or do you have any destination weddings you’re attending? Leave some tips for brides and grooms in the comments below.